Apple and Japanese wireless carrier NTT DOCOMO on Wednesday announced the iPad Air and iPad mini with Retina display will finally hit the country's largest network next month, with preorders starting on June 2. News of the tablets' upcoming availability has been anticipated by industry watchers since DOCOMO inked a deal with Apple to carry the iPhone last September after years of going without. The Japanese mobile giant will be once again be late the game as competitors SoftBank and KDDI have had access to the iPad lineup for some time. DOCOMO's iPad Air and Retina iPad mini will hit the carrier's "Xi" 4G LTE network on June 10 alongside new data sharing plans for family and business. "With the addition of iPad alongside iPhone, we now offer the complete lineup of Japan's most popular mobile devices on the nation's most reliable LTE network," said Kaoru Kato, President and CEO of NTT DOCOMO. "We know our customers will enjoy using iPad Air and iPad mini, and anticipate that new customers will look to experience these amazing devices on our high-quality network with our new billing plan." Japan's dominant mobile phone provider has been an important driver of iPhone sales in the region and, combined with China Mobile, accounts for a significant portion of Apple's Asia Pacific iOS device sales. DOCOMO initially held off on agreeing to Apple's partnership terms until subscribers began defecting to competing networks for iPhone access. One report estimated that some 66 percent of former NTT DOCOMO customers dropped the carrier for Apple's handset. "We are extremely happy for iPad to join iPhone on NTT DOCOMO's network," said Apple CEO Tim Cook. "The results on iPhone have been tremendous, and we look forward to delivering iPad to NTT DOCOMO customers." 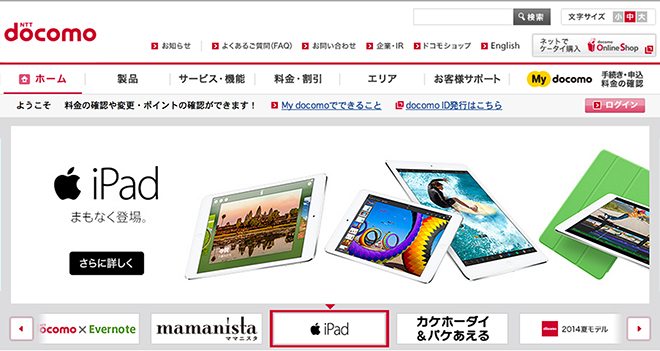 While official sales begin on June 10, DOCOMO is planning to open preorders for the Apple tablets on June 2. The company is also running a promotion that grants 100 DOCOMO points, or roughly $100 in credit, to new multi-line family plan buyers who purchase of two or more iPads.